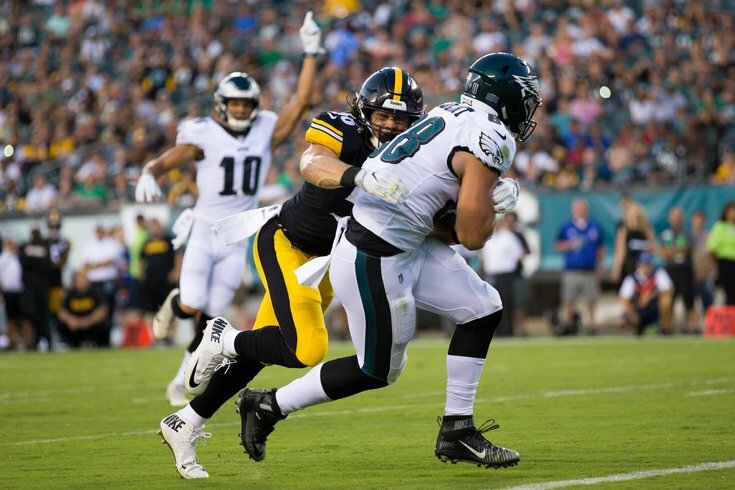 Philadelphia Eagles tight end Dallas Goedert makes a touchdown reception against Pittsburgh Steelers linebacker Anthony Chickillo during the second quarter at Lincoln Financial Field. What's even better than watching an entire preseason football game? Reading all about what everyone thinks about it, of course! The Eagles got the first game of the slate out of the way as they begin their pursuit of a second consecutive Lombardi Trophy — what a weird sentence to type — so there are plenty of highlights and lowlights to weigh already. Now that you're up to speed, here's a look around the city at the notes writers are passing around on Friday. In such abbreviated action it's hard to come away with a lot of concrete information, so these opportunities are tailormade for quick observations and musings vs. deep dives. Spadaro has you covered on that front. One player he focused on was an offensive standout in his very first game: tight end Dallas Goedert. The rookie turned a few heads against Pittsburgh, and as Spadaro notes should make for an awesome partner with Zach Ertz. Rookie tight end Dallas Goedert may very well prove to the be the real deal. He looked instantly comfortable in his debut, catching a 15-yard touchdown pass from Sudfeld among his four receptions for 66 yards. Goedert had a drop when he took his eyes off the football, but he came back strong. And he blocked well. It was a smooth start for Goedert, playing in place of Zach Ertz. Mailata did not exactly get off to the greatest start in the world, giving up a sack and subsequent fumble on his very first attempt at pass protection. You can clearly tell he hasn't been around the block before. But credit to the young man for keeping his head up and his spirits high, because he ended up having a decent night at the office for a guy who'd never laced a set of football cleats up before. He had an early case of what he described as “jelly legs’’ and gave up a sack and forced fumble to Steelers rookie linebacker Olasunkanmi Adeniyi on his third play from scrimmage. But after that, he settled down and turned in a surprisingly good performance, especially when you consider that, nine months ago, you could’ve fit everything the guy knew about the game of football on a Post-it note. “Having one of your first plays be a sack, that’s a massive learning curve,’’ Mailata said after the game. “But after I gave that sack up, I had that next-play mentality. I just focused on the next play. Mailata received a lot of support from Stoutland and his teammates, particularly fellow tackles Jason Peters and Halapoulivaati Vaitai. He quite obviously has the physical talent, so if he can combine that with a competitive spirit and better understanding of the game, who knows. Goedert was probably the No. 1 name being discussed after the game, and why not? Outside of a lone drop in the first half, he did an excellent job of living up to his reputation as a threat in the secondary. Philadelphia's skill position group is crowded, but there's no reason to believe Goedert can't excel as a big piece of the machine. Pederson said he made it a point to feature Goedert some in the early going of Thursday's game. He wanted the young tight end to get in a rhythm with Sudfeld. It certainly worked. This season, it’s hard to figure out what Goedert’s stat line might look like. After all, he’ll be sharing a field with some extremely talented players like Zach Ertz, Alshon Jeffery, Mike Wallace, Nelson Agholor, Jay Ajayi, Darren Sproles, Corey Clement, you get the idea. But it’s fair to think Goedert can definitely help the Eagles this year. He already showed signs of that Thursday, when he caught his first NFL touchdown pass. How did Eagles rookies handle their preseason debut? The focus on Sheil's end came, as it probably should have, on the aforementioned Goedert. Anytime you score a touchdown and serve as an obvious security blanket for your quarterback in the very first game, you're going to stand out. What will probably be more important (or at least as important) for Goedert and the Eagles this season is his ability to contribute as a blocker. Replacing Brent Celek, who was essentially an extra lineman late in his career, with a rookie tight end has the chance to mess with the run game and pass-protection schemes. He did well against Pittsburgh, all things considered. Goedert looked comfortable blocking as well. He’s far from a finished product but has clearly taken positive steps in the spring and summer. The Eagles threw him right into the fire, asking him to “wham” unsuspecting defensive tackles — something he did not have to do in college. “I never really whammed the three-tech defensive tackles in college, but we have it in this offense, and it’s something that I’m willing to do, able to do, so it’s kind of fun,” he said. How much does winning and losing matter in the preseason? Not at all, at least at the team level. But the guys competing for roster spots or their place in the team hierarchy certainly care a great deal about how they perform before the regular season begins. Honestly, I was fine with Rasul’s night. Doulgas also insisted during the post-game interviews that DB coach Cory Undlin was as well. Sul likes to attack the football and the catch point, and those plays typically dictate a boom-or-bust result. He got tripped when in the air on the initial long touchdown to Juju Smith-Schuster, and he was a fraction late getting his hand up on the touchdown to Flippy McFlip against the endline. I probably fall more on the harsh side of Douglas judgment, even taking the nice plays he made last night into account. It's one thing to say a guy got a bit unlucky if he gives up a couple long gainers between the 20's. But when you give up two touchdowns, it's pretty difficult to get excited about the good plays and positioning otherwise. As it turns out, people like organizing their thoughts in abbreviated fashion these days. Who knew?! Right at the top of the list for Frank is something Mr. Kempski pointed out this morning — the top defensive unit looked doggone good, even when you account for them playing against backups. Honestly, I’m OK if the key guys on the starting defense don’t play again until Sept. 6. That won’t happen, but I just feel like this group is ready to go. I know the Steelers didn’t play several of their starters, including Ben Roethlisberger, Antonio Brown and Le’Veon Bell, but the Eagles’ first defense held Pittsburgh to two yards on two drives and then Doug Pederson and Jim Schwartz correctly got it off the field just five minutes into the game. Can't really disagree with any of that. Fletcher Cox came out looking like a man possessed last night, and I'm pretty sure he'll do the same on opening night regardless of whether he plays another snap in the preseason. Bausby made it clear he decided to demonstrate individually. He and Jenkins said the Eagles don't discuss the national anthem because they don't want anyone to feel pressured into participating in something they might not necessarily be comfortable with. Bausby said there was no single event that pushed him into joining the national anthem demonstrations last season. Jenkins began demonstrating in 2016 after former NFL quarterback Colin Kaepernick began kneeling to bring attention to police brutality and violence. Jenkins has focused on a number of causes, including mass incarceration. Jenkins wore an undershirt with incarceration statistics on it before Thursday night's game. And while Bausby has made his decisions to demonstrate independent of Jenkins, the elder defensive back is helping Bausby become more involved in different causes.